Middle and South Park are two high meadow areas south of Pleasant Canyon separated by intervening ridgelines. Some snow lingered on the north sides of these ridges as we drove the roads crossing over them, marvelling at the beauty of these wild places. Our drive ended at an overlook on the main crest with a fine view looking down into Butte Valley where we'd visited the day before. 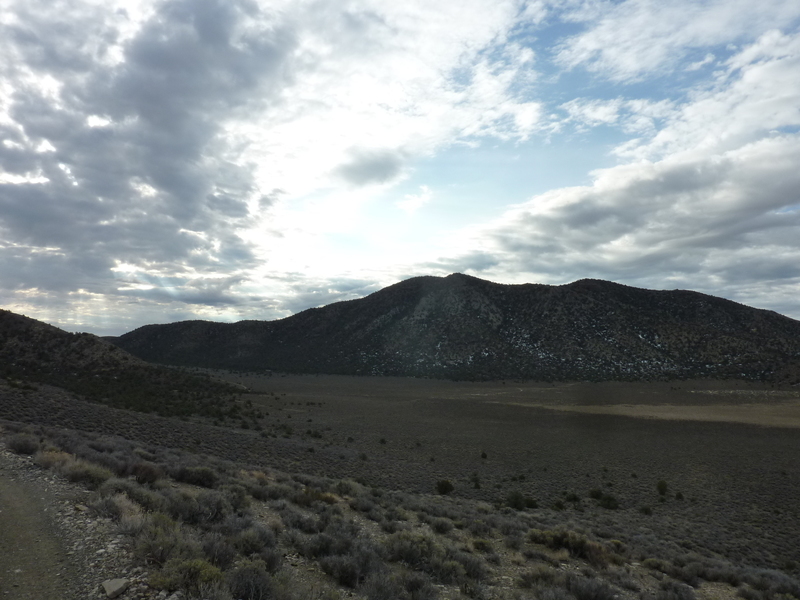 Though the sky was overcast it took nothing away from the beauty of the desert landscape spread out below us. We were parked barely a mile from the summit of an unnamed P900 that I've dubbed South Park Peak. Since it was below the usual standard of 1000ft of prominence (P1K), I didn't expect it to have any of the usual visitors such as Vitz, Carey or Sumner. The hike to reach it was not very taxing, a pleasant enough hike over hilly desert terrain. The route follows the crest of the range separating Butte Valley from South Park, climbing about 800ft in the process. While we found no register, we were far from any first. NPS surveyors had walked the park's (or monument's, back in the day) boundary long before I ever took up this hobby, leaving boundary signs and survey markers all along the way. Some pinyons and junipers sprinkled about the summit hampered views in some directions, but one could still see nicely off to the west and especially north along the crest of the range. We spent about an hour and a quarter on the short hike, returning by 10:15a. At this point we had several options. I was interested in Mormon BM while the others were more interested in the DPS summit of Porter Peak. Between our overlook and Mormon BM were two unnamed summits of minimal prominence. A rough, steep road goes over both on its way to Rogers Pass just south of Mormon BM. Could we drive it? We gave it a shot but didn't get very far, stopped where the road grew too steep with insufficient traction for the jeep, about halfway up to the first of the two peaks. The original plan had us driving back to Pleasant Canyon and Mormon Gulch on the south side of Porter. From there, the others would ascend Porter while I went off to Mormon BM. In rethinking this plan, it seemed I could hike from this point up and over the two unnamed summits and Mormon BM in about the same time they could do Porter. So we consulted the GPS to pick a parking spot where I could find the car later, and with that Karl and Tom drove off and left me. This was the second time in two days I'd been set adrift while those two drove off without so much as a wave. Maybe they were trying to tell me something. At least this time the worst case scenario meant only an extra 10mi hike down Pleasant Canyon. Not exactly pleasant, but manageable. It was a very enjoyable hike along the crest, even if the two summits and a few other intermediary bumps had nothing to call attention to themselves. I had some small satisfaction knowing I could easily hike up a road the jeep couldn't handle - take that, mechanized modes of travel! The summit of Peak 7,335ft had a few trees but little else aside from the nice view south of Manly and South Park Peaks. There was a bit of snow on the north side of the hilltops but not enough to have bothered the jeep or even myself on foot. At a saddle south of Peak 7,460ft the road forked in several directions. An unnatural seagreen color caught my attention and enticed me to try the lower fork to the left. I found an old abandoned truck stripped of most everything useful, another casualty in the perilous saga of Death Valley mining. The summit of Peak 7,460ft proved about the same as the previous one with the better view now to the north to Mormon and Porter. At the saddle with Mormon I found a monument naming it as Rogers Pass and its significance in the annals of Death Valley history (in their search for a way out, Manly and Rogers had gone over Rogers Pass, but bypassed this for the easier Redlands Pass upon their return). It had been placed in 1992 by Trona resident Leon Collard, a precision welder. The monument is a single sheet of steel with block letters painstakingly cut out, much like the 80yr-old trail signs in Yosemite NP. Leon unfortunately died a few months later in a motorcycle accident in Canada at the age of 64. From Rogers Pass the road heads west and down to Middle Park. A rougher branch continues north towards Mormon BM, but it dissolves into nothingness about half way to the top. The cross-country is easy enough, taking about 40min to reach the summit from Rogers Pass. A microwave relay tower is found just off the summit to the west, the benchmark and a register at the rounded top. Richard Carey had left a register book in 2011 with six pages used since then. A loose scrap of yellow paper dated to 1986 and included a 1992 entry from Jeff Moffat who was traversing the range from Rogers Pass to the kilns near the end of Wildrose Rd north of Telescope Peak. It had taken less than two hours to make it to Mormon BM after being dropped off and I was feeling pretty good. Porter was less than two miles to the north and it seemed a pretty straightforward continuation along the crest. I had encouraged the others to continue to Mormon after doing Porter, thinking we'd be able to meet each other in passing along the crest and so I headed off in that direction. There was more continuous snow coverage on Mormon's north side than I had seen yet, but it was no more than 2-3 inches in most places and cold enough that my boots didn't even get wet. Past the initial north slope, the snow gives out and the crest narrows for a stretch of almost a mile. It would be easy to spot the others going the other direction in this section and though I kept a watchful eye out, I saw not another soul. As the crest begins to climb up to Porter it broadens and becomes more forested with pinyon and juniper blocking views and causing me to weave more in finding a route through. Somewhere in here I must have missed Karl and Tom going in the other direction because as I was only about ten minutes from Porter's summit I first noticed fresh boot tracks in the snow patches that were making their appearance again with greater frequency the higher I climbed. It was nearly 1:30p by the time I reached the summit where one gets an excellent view north to Sentinel and Telescope. The register found in a green ammo box had some 85 pages filled since it was placed in 1987. An earlier scrap dated 1984 was a DPS "Exploratory Climb" which suggests the peak was added to their list sometime after this. There is a notable gap in the book between 2006 and 2010. I suspect the book had gone missing during that time because on my first visit in 2007 I had signed into another book that itself has gone missing. Such is the life of the ephemeral Sierra registers. The last entry in the original book was of course from Tom and Karl. I added my own name after theirs and then put the register away to consider my descent. I had a pretty good idea of where to find the jeep on the south side of Porter in Mormon Gulch, so I plugged the likely location into the GPS and used that as a guide as I started down the south side. The upper third of the mountain was a mess of loose rocks, softball to toaster in size that were not much fun. I found myself searching out the forested parts of the slope where the footing underneath was surer and faster. Further down the rocks gave way to more forest and the descending becomes much easier - the ascent via this route looks to be exceedingly tedious and I was feeling sorry for the others for having come up this way. It took less than half an hour to find my way down to the road and the jeep which had been parked in a conspicuous spot where the road forks. I put on some warmer clothes as I settled in to wait for the others who were about half an hour behind me in descending from Mormon.